It takes equilibrium and a lot of imagination. You have to be strong and know how to dose your strength. You need to throw your heart over a problem, past all difficulties. And you need passion. A lot of passion, which closely resembles unconditional love. 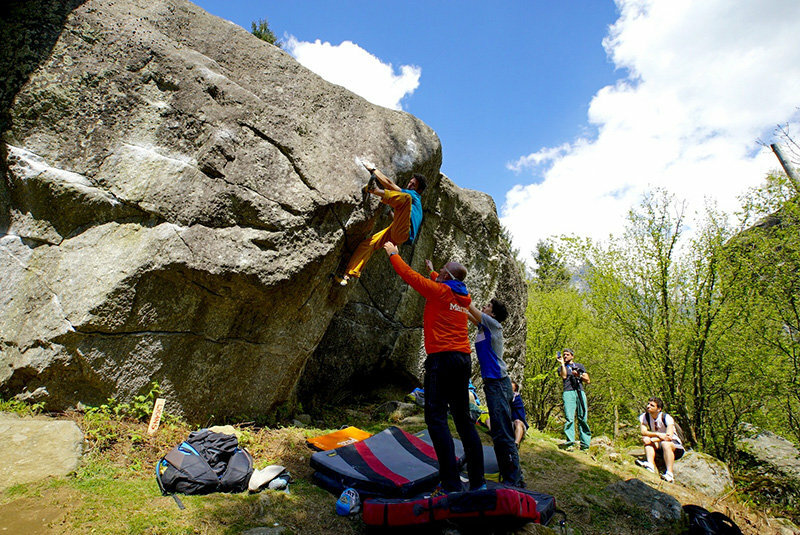 In short, in climbing, and in bouldering of course, you need lightness. A lightness that has no real weight, but instead one that simply makes you feel good. It makes you smile. Enables you to perceive beauty. And of course you need to know how to play, how to interpret the meaning and soul of this game. Just as, for example, the (many) girls and boys who took part in Melloblocco 2016. Theirs is a game with needs no explanation, no describing its „usefulness.“ It’s something you just do. Because it’s right to do so. Because you need it. Melloblocco, this magnificent edition Melloblocco 2016, perhaps served this purpose. It served to understand that Mello is a firm reality, and that you can’t do without it. Because it is beautiful. Because it belongs to everyone. And because it makes us all a little happier. A happiness that immerses completely in climbing and is nourished by the extraordinary beauty and strength of this Valley. Let’s finally admit it: there has to be a little magic to all this. Otherwise it’s hard to explain why each Melloblocco always seems so similar to those that preceded it but, at the same time, so totally different and unique. This year, for example, the atmosphere was marked by a special peace and tranquility. How come? What had changed? Certainly the „crowds“ hadn’t; never before had so many Melloblockers reached the valley (2,800, a world record by a large margin). And never before had so many youngsters taken part. Many, as it happened, from abroad. Yet that almost magical and relaxed Karma was palpable, was experienced by all. The happy and relaxed spirit of this Mello 2016 could be felt everywhere. In the interminable and unmissable climbing game that, as always, never stopped, not even for a second. In the by now classic MelloYoga sessions (the one on the summit of Sasso Remenno was truly unforgettable) taught by Alberto Milani and Sara Grippo. In the great night parties (Saturday night was legendary). In, perhaps above all, the special MelloBaby dedicated to the multitude of boys and girls. 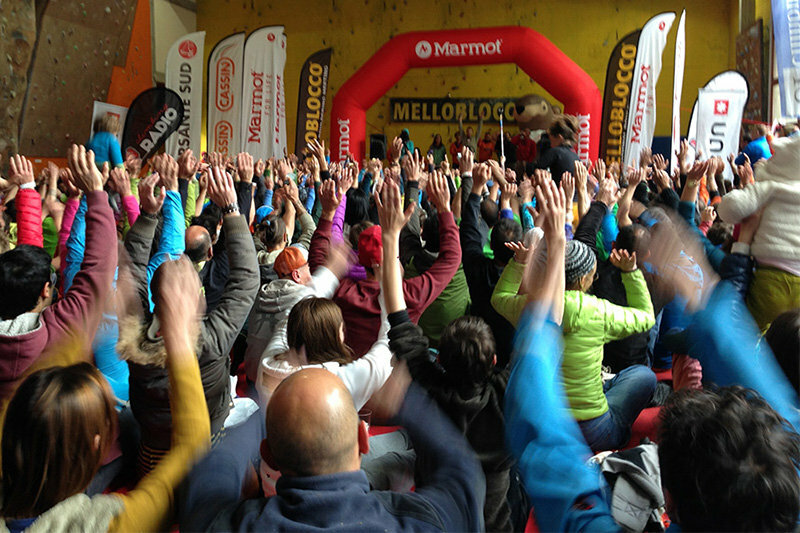 And even in the crowded evening talks and videos, held by pro climbers. And in the incredible Zlagboard Contest sessions, an absolute must-do test this year. All were united by a sort of collective, positive wave that seems to have given Mello 2016 its unique soul. A wave that reverberated across the entire Valley and Mello. 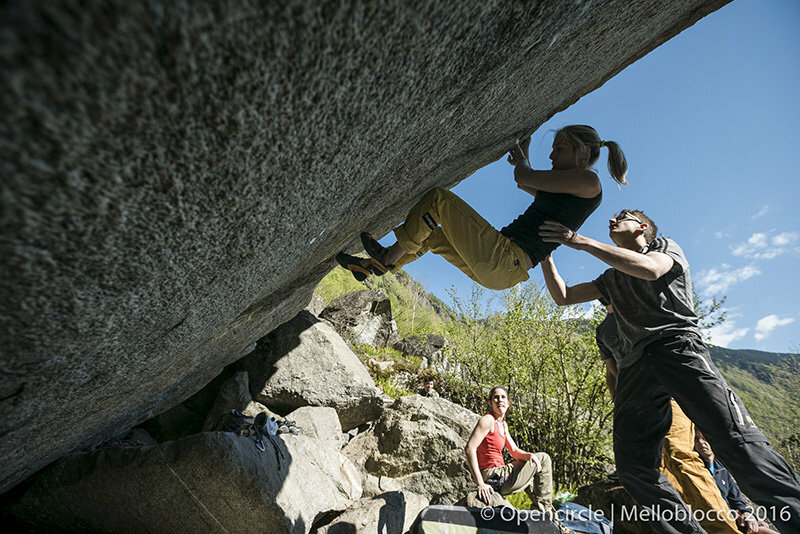 In every boulder problem, of all shape and difficulties, to all melloblockers of all ages. Because, if it’s not clear yet, Melloblocco is done by all and belongs to all. 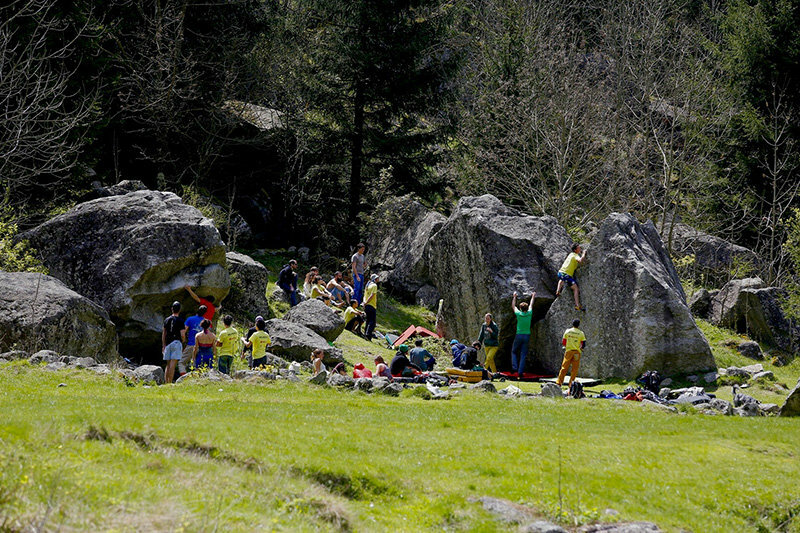 This „calm chaos“ and beauty atmosphere could even be felt during competition on the 12 +12 new boulder problems, those with the prize money attached, reserved for the very best. Of course battle was done on these problems – set as always by Mister Pedeferri, and left as a legacy every year for the valley and for all climbers. Everyone did their very best to resolved these vertical puzzles. In the end Jenny Lavarda, on firing form, sent the most problems (8 tops), followed by Finland’s Liina Anna Laitinen (7 with 3 flash) and then by Annalisa De Marco (5), Madeleine Eppensteiner (4 top with 2 flash) and Irene Bariani (4 top with 2 flash), Michelle Theisen (4 top no flash). In the men’s bouldering event it was Stefano Ghisolfi who took down most problems (9 tops, 2 flash), ahead of Anthony Gullsten (8), Andrea Zanone (7 top with 1 flash), Stefan Scarperi (7), Michael Piccolruaz (6 top with 4 flash), Jorg Verhoeven (6 top with 1 flash), Valdo Chilese (5 top with 1 flash) Andrea Ratti (5 top). So this is how the 2016 edition came to an end, with a few drops of rain in the dying moments of the event. After so much sun a bit of rain didn’t make any difference, and in truth Mello wouldn’t be Mello without some rain… So while people bid farewell to 2016 and their gazes lingered on the latest views into the Valley, that girl springs to mind who just a short while ago – after yet another failed attempt – burst out: „that’s enough! I’ll do it next year… „. „What do you mean?“ someone asked her boyfriend „you’re sure you’ll be back next year?“ „Of course we will!“ was the immediate answer. As it to say: what a silly question! Yes, people return to Mello. Because it’s there. And because there’s a need for it. And, this year too, we happily got lost in this great game of climbing.